A 16-year-old boy wearing a women’s spandex bodysuit was stopped by U.S. Border Patrol agents at the Highway 86 checkpoint in Southern California on Wednesday afternoon. The U.K. Daily Mail reported that the teen was caught at the border trying to smuggle heroin into the United States. 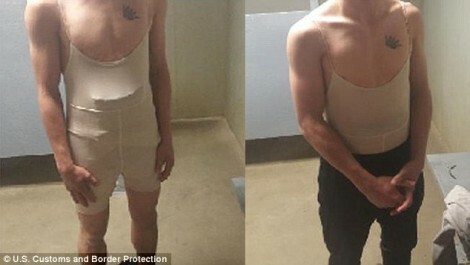 The 16-year-old had strapped the packages of heroin to his body and then put on the women’s bodysuit in an attempt to conceal them from customs officials. Border Patrol agents noticed that the teen looked nervous at the checkpoint. When agents began to pat him down, they discovered the packages of heroin. In all, the boy had four packages of the illegal drug, weighing a total of 3.85 pounds. The heroin had a reported street value of $46,200. This teen’s name was not released, presumably because of his age. He was suspected of being a drug mule, perhaps forced to carry drugs across the border by the powerful Mexican drug cartels. “The agents of the El Centro Sector Border Patrol continue to safeguard our nation and its citizens by keeping dangerous drugs such as these from reaching our streets,” Acting Chief Patrol Agent Roy Villareal said. So far this year, the Border Patrol has seized over 186 pounds of heroin in this one sector alone. The drug cartels in Mexico have gone to some extreme lengths to get their drugs into America. Networks of underground tunnels crisscross the border, and the cartels have even tried using catapults to get their drugs over the border. The drug trade from Mexico has been a major source of concern for U.S. officials. While some of the drugs are intercepted along routes that the Border Patrol watches over, literally tons of drugs continue to flow into the country largely unimpeded thanks to poor border security along a large chunk of the U.S.-Mexico border. Many Republican candidates have pledged to make border security a top priority should they be elected. This latest — admittedly, somewhat ridiculous — attempt to subvert America’s security is just one more reason why that promise matters to American voters from both parties. Share this on Facebook and Twitter and let us know what you think should happen to this teenager now.